This entry was posted on February 8, 2019 by Magnattack. Dead-zone is a term often used when discussing the design of magnetic separation systems, particularly those for liquid/wet food applications. Put simply, a dead-zone is an area in which food product or foreign contamination may rest or may pass through without coming in close contact with the magnetic field. This can occur even if a drain is present. Not only is this unhygienic and can allow bacteria or mold growth, it also risks foreign contaminants (including metal fragments) passing unhindered beneath the magnet and returning to the clean product flow. Dead-zones are typically found in poorly designed magnets, such as some Multi-Finger Pot Magnets/Liquid Trap Magnets. ​These designs allow multiple fingers to sit inside a 'pot' and, although they can be effective in removing metal fragments if the magnetic circuits are designed correctly, they are typically unhygienic and not suitable for sensitive food manufacturing applications. The Magnattack RE80 Liquid Pressure Pipeline Separator (PPS) effectively overcomes these problems. With highly sanitary construction and multiple powerful +11,000 Gauss magnet probes installed at right angles, dead-zone risks are eliminated and magnetic separation efficiency is greatly increased. The PPS carries HACCP International Certification and offers over 80% coverage of the product stream as required by Food Safety Standard 0909MAGSEP 1-2010. The system has been proven successful in numerous applications including chocolate, sauces, ketchup, beverages, and soups. Dead-zones are often found in Liquid Trap Magnets. 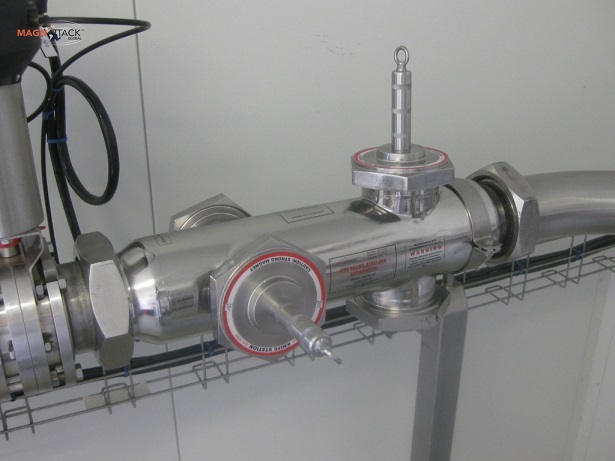 RE80 Liquid Pressure Pipeline Separators are a hygeinic alternative to Liquid Trap Magnets, with no risk of dead-zones. 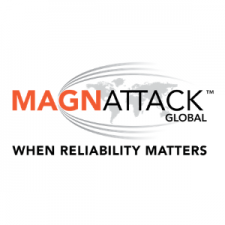 Magnattack Global - When Reliability Matters.